Dinarded’s Dinar Quest was created to collect, disseminate, and discuss information, from across the web, in relation to the New Iraqi Dinar and it’s possible Revaluation. All comments are welcome! I apologize up front for the length of this post BUT I hope my efforts here will help shed a little light, on what may or may not be true, in relation to the value of OUR INVESTMENT in the Iraqi Dinar. I want to emphasize the term “OUR INVESTMENT” because I OWN DINAR too. I am not what you might consider an “old timer” in this investment. In fact, I have owned my Dinar for less than a year. I made my first purchase in November of 2009 because a friend suggested I do so, quickly. Normally I do not JUMP into anything but I was convinced that he might be right; so I made my purchase. I think, in the effort of full disclosure, I should at least throw my “qualifications” out there, for speaking on the Dinar, before you read any further. I am not a currency trader nor am I an investment advisor. I was however, a registered representative (stock broker – Series 7 – fully licensed by the Fed and the State of Texas) for 6 1/2 years. I was an ACTIVE broker (managing client accounts, making stock recommendations, executing buy and sell orders, and researching prospective opportunities for my clients) for the first 4 of those years. To put it in simpler terms, I was a “Bud Fox” (Like in the movie Wall Street). No, I never got to sleep with Daryl Hannah (a chick – for those that don’t know) but then, nobody’s perfect. As you can see, I am NOT a currency specialist; nor do I play one on tv. But what I do posses, is the mind of someone who understands markets and securities. I am not making the claim of being a financial guru or that I am even qualified (in the most astute sense of the word) to tell you guys what to do with your money. Cash, whether it be the USD, the IQD, the EURO, or the Peso are considered “securities.” And as such, their values fluctuate on the most basic of financial principles; “supply and demand.” For those of you that would like to read up on how a central bank controls the value of their respective nation’s money supply, I would suggest you google the purpose of a central bank. We have all been told that 25 Trillion Iraqi Dinar were printed. Of that amount, we have no way of knowing how much of that currency the Central Bank of Iraq still holds in it’s liability column. Or, how much of that cash is in the hands of the global public. As of 2010, the population of Iraq is approximately 31,234,000. So we have a nation of people who’s population totals a little over 31 million, who’s central bank originally had 25 trillion of their dollars (dinars) printed for circulation. Now let’s compare that to a country like, oh I don’t know……The United States. Probably a good place to start since their money is pegged to our dollar. And as shown below, we currently have 1,132,337 Trillion dollars (real currency) in circulation. Of course the Fed (Federal Reserve) is on the hook for much more than hard currency but that’s another discussion altogether. We have a nation of 31.2 million Iraqis that are fighting for their share of 25 trillion worth of cash. We have a supply for a market and a demand for the equity on that security. At this point, the only REAL demand for that equity is created by the 31.2 million Iraqis. Other than travelers and speculators (like us) there isn’t much demand internationally. Thus, the whole point of bringing the IQD to the international markets. Now I ask you this….. Does it make sense that a currency, without much marketability, would maintain it’s current level of supply, and hit the international market at a 3 to 1 ratio to one of the most valuable currencies on the market? Wouldn’t it make more sense to reduce the currency supply before bringing the currency to the international market? But is it possible that there is a “plan” in place that ISN’T exactly what WE are all hoping for?? I already know the counter arguments to this and I know that the BIG thing people like point out is the “low rate of inflation” in Iraq. But what does that REALLY mean? Well, the definition of “inflation” is: The rate at which the general level of prices for goods and services is rising, and, subsequently, purchasing power is falling. So when someone points out that inflation in Iraq is “under control” or “low”, what they are saying is that the prices of goods and services are increasing, annually, at a low rate. The problem with this argument is that the ridiculous amount of currency needed to purchase goods and services in Iraq is still WAY out of line when compared to non-third world nations. I mean come on; it takes 40-50 of US currency to take the family out to dinner on a Friday night. In Iraq it takes 40,000 – 50,000 of THEIR currency for the same meal. So the nominal value of their currency, while common place in Iraq, is in no way representative of a currency holding any REAL value. That’s why it takes SO MUCH OF IT to purchase goods and services in Iraq. When people talk about the historical value of the Iraqi Dinar, they like to point out the rate prior to Sadam’s reign. And that rate may have been a legitimate valuation of the currency at that time. BUT….what was the country’s population and how much currency was available to the market? I can almost promise you that BOTH figures are dramatically smaller than what we are seeing today. Look, I am not here to bash hopes and dreams. I am not here to cause discontent and I am not here to dissuade folks from doing what they want to do with their money. All I am trying to do is put forth reasonable posits that MUST be considered by EVERY PERSON, that owns Iraqi Dinar. Now I know that MANY will respond negatively to this post and I am ok with that. I am merely sharing the thoughts, questions, and reservations that I have in relation to OUR INVESTMENT. 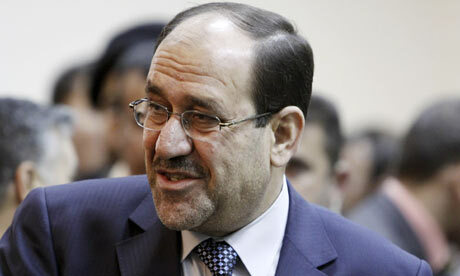 The move effectively ends the career of Iraqi prime minister Nouri al-Maliki. The followers of Muqtada al-Sadr, who form a king-making bloc in the next Iraqi government, have confirmed they will not accept Prime Minister Nour al-Maliki’s candidacy for a second term as leader. The move effectively ends the career of the US-backed incumbent. The Sadrists’ stance comes after a five-month political stalemate that threatens to leave Iraq leaderless, as the remaining 15,000 or so US forces leave the country ahead of a 31 August deadline. The move is seen as a potential breakthrough in the destabilising deadlock that many believe has led to a steady increase in violence. The decision was confirmed today by the head of the Sadrist political bloc, Nassar al-Rubaie. He said he had told Maliki that he would have to leave his post in order for the Sadrists to maintain support for his party in an eventual coalition government. Without the support of the Sadrists, who are led by the exiled anti-western cleric, Muqtada al-Sadr, neither of the two biggest rival political blocs would be unlikely to be able to form a government. This includes the head of the Iraqiya Alliance, Iyad Allawi, who last month courted al-Sadr’s support in a public meeting in the Syrian capital, Damascus. However, al-Rubaie indicated that the Damascus summit has not led the Sadrists to split from the largely Shia Islamic bloc that threatens to sidelineAllawi’s cross-sectarian alliance. Al-Rubaie revealed that the 40-strong bloc of MPs in an eventual new parliament had thrown their support behind former transitional prime minister Ibrahim al-Jaafari, who led Iraq throughout 2005, on the eve of the breakout of full-blown sectarian chaos. “Maliki eventually isolated all around him by his behaviour,” said al-Rubaie. “This includes all members of his alliance. In the end, it was only his Dawa party that had influence that spread throughout all branches of government. The Sadrists have had a strained recent history with Maliki whom they accuse of allowing US jets to bomb Sadr City in Baghdad in 2007 and 2008 and of reneging on a pledge to release up to 400 Sadrist prisoners who were handed over by US forces late last year. “Whenever we asked him anything, he would say yes, yes, yes, then not keep any one of his pledges,” said al-Rubaie. The move against Maliki was announced yesterday by former deputy prime minister, Ahmed Chalabi, whose Iraqi National Congress Party has allied with the Sadrists and the main party in their bloc. Both Chalabi and al-Jafari remain deeply unpopular with the US government. They accuse Chalabi of providing false information that helped make a case for the 2003 invasion. The US gripe with al-Jafari, however, is that he failed to safeguard the country from a slide into sectarian crisis. Iraqi officials said yesterday that July marked the highest nationwide death toll of any month since the same period in 2008. They said 535 people were killed and 1,043 wounded during violent attacks. However, the US military later refuted that figure, claiming only 222 people were killed last month, less than half the number compiled by Iraq. US officials have dreaded a scenario of Iraq remaining without a new government after their combat forces have left by the end of the month. The US have been equally sensitive to claims that violence is increasing and that services have barely improved throughout over the past seven years. Baghdad: Iraq’s inflation rate remained at its lowest level in three decades for the second straight month in May due to lower prices for food, non-alcoholic beverages, communications and energy, a senior central bank official said yesterday. Inflation was unchanged at three per cent in May versus April, and down from 4.7 per cent in May 2009, Mudher Qasim, the central bank’s adviser, said in an exclusive interview in Iraq’s capital, Baghdad. Qasim said the central bank has no plans to cut interest rates. Iraq’s central bank last cut its base interest rate by 100 basis points to six per cent in April. The bank also has no intention to change the exchange rate of the Iraqi dinar, which has been at 1,170 to the US dollar for more than a year, in the foreseeable future, he added. The video below is a clip from July 21, 2010 on Fox News’ Fox & Friends Morning Show. Here are a couple of links that you may find interesting………..Google the group for yourself! Looks like ole Enorrste, Gankans, and TerryK are HOMELESS again! Currency Chatter.com continues to be the leader in currency investment resources on the internet. We work hard to provide you with the most relevant and up-to the minute information. Because of our high value we place on having a team with the utmost integrity, we have accepted the GET Team’s resignation from Currency Chatter. Please join us in wishing them well in their future endeavors. Currency Chatter will continue to provide you with the latest intel and analysis regarding your investments.